Anantara Riverside Bangkok Resort invites the guests to experience the delightful festive moments and cherish the most memorable festive season with extra special offers for celebrating in a tropical urban resort by the majestic River of Kings. Christmas Eve and Christmas Day feel even more spirited with carol singers and visits from Santa and Santarina. While the resort’s riverside location promises the ideal setting to watch the spectacular fireworks on New Year’s Eve. · Tuesday 1 December 2015 – Friday 1 January 2016. Give a gift from the heart and feel the true spirit of the festive season. Purchase a decoration for our tree and all proceeds will be donated to local charities to help those in need. 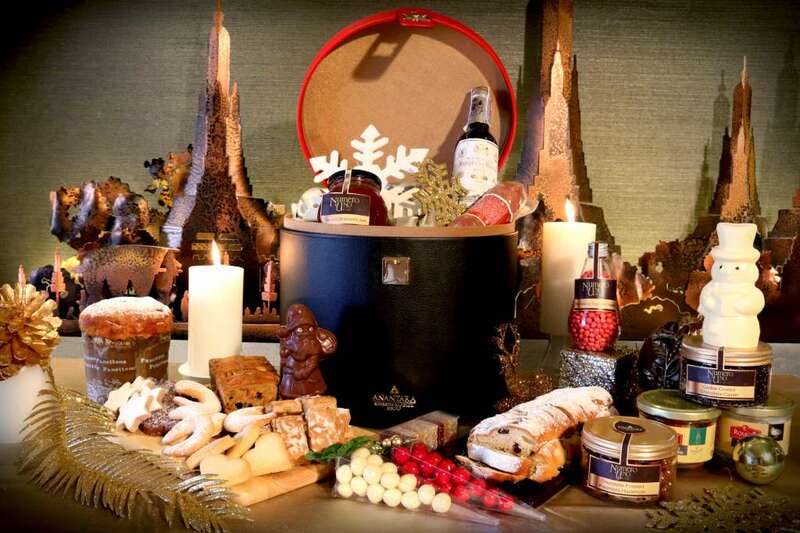 · For this year’s festive season, Anantara Riverside Bangkok Resort offers an excellence selection of festive gourmet delicacies and wellness specials, suitable for the perfect holiday gift for friends, family or business associates. Our handcrafted Gourmet Hampers are inspired by the majestic Chao Phraya River, each given a Thai name symbolising the beauty and the significance of the river’s rich heritage. 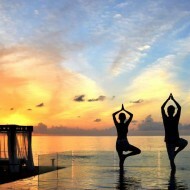 Our Wellness Hampers epitomise Thailand’s luxurious nature which is abundant with healing and rejuvenating properties. We would be happy to assist you create your own, should you prefer to create your bespoke hamper. Our signature Celebration Hampers are available at Numero Uno, price starts at THB 2,000+ for small luxurious leather hamper. · Riverside Terrace: Christmas Eve Gala Buffet at Riverside Terrace, 6.00 pm onwards. Savour a lavish international buffet with contemporary Thai performances, Christmas carols by opera singers and our star guest Santa with his helpers. THB 3,500 net per person with free flow soft drinks and juices Add THB 1,400 net per person for a beverage package of free flow cocktails, beers, standard spirits, wines and sparkling wines. · Manohra Cruises: Christmas Moonlight Cruise with Thai Fusion Set Menu on Manohra Cruises from 7.30 pm – 10.00 pm. 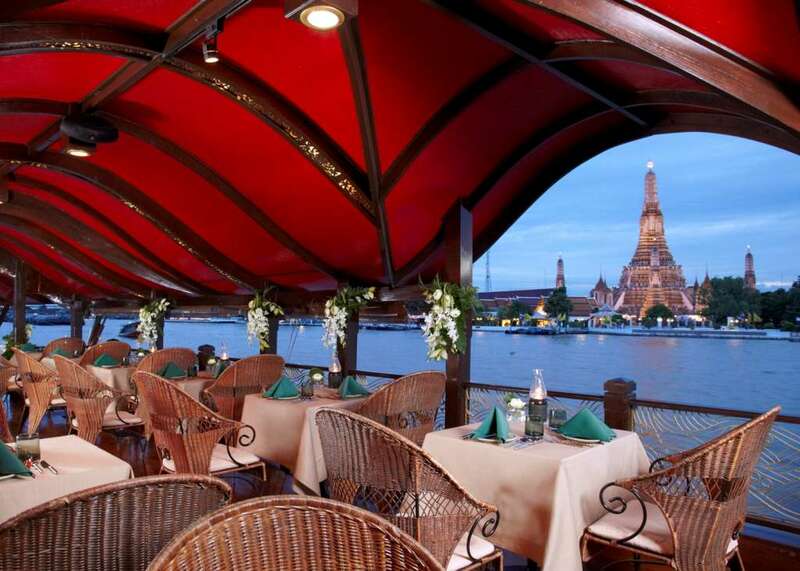 Enjoy gourmet Thai creations with atmospheric entertainment by an acoustic guitarist, as you saunter along the River of Kings on the luxurious antique rice barge. THB 5,500 net per person with free flow soft drinks. Add THB 1,400 net per person for a beverage package of free flow soft drinks, beers, standard spirits, wines and sparkling wines. · Trader Vic’s: Traditional Christmas Eve Set Menu with the stunning view of Chao Phraya River at Trader Vic’s, 6.00 pm – 11.00 pm. Delight in a special festive set menu, including roast turkey and all the trimmings, with vibrant entertainment by our fantastic resident band. THB 2,900 net per person with a glass of sparkling wine. 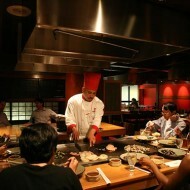 · Trader Vic’s and Benihana: Family Christmas Carnival Brunch at Trader Vic’s and Benihana, 11.30 am – 3.30 pm. Indulge in the best of both worlds with culinary highlights from two unique restaurants, presented in a never ending feast. Relax while children join in the festive fun of Christmas carnival games and a visit from Santa and his helpers. THB 3,900 net per person with free flow wines, standard spirits, cocktails and sparkling wines. Add THB 1,500 net per person for free flow champagne. THB 750 net per child aged 3-7 years old. THB 1,500 net per child aged 8-16 years old. · Riverside Terrace: Christmas Day Dinner Buffet with the majestic view of Chao Phraya River at Riverside Terrace, 6.00 pm – 10.30 pm. Feast on world flavours and roast turkey served with all the trimmings, followed by decadent desserts. Revel in the spirit of Christmas with uplifting entertainment by our resident band, contemporary Thai performances and photo opportunities with Santa and his helpers. THB 2,900 net per person with free flow soft drinks and juices. 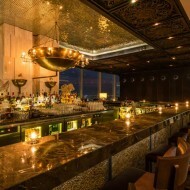 Add THB 1,400 net per person for a beverage package of free flow cocktails, beers, standard spirits, wines and sparkling wines. · Riverside Terrace: New Year’s Eve Party “A Night in Chicago” at Riverside Terrace, 7.00 pm onwards. Revel in a sumptuous dining experience including the festive delicacies such as Turkey, Lamb, Wok Fried Mud Crab with Curry and Egg Sauce, and Lobster Cashew Nuts, complemented with a dramatic “Chicago” performance by the Grand Opera of Thailand, as well as contemporary Thai performances, live entertainment and dance music by the Big Boy Band, leading into a climatic countdown to the dazzling midnight fireworks. 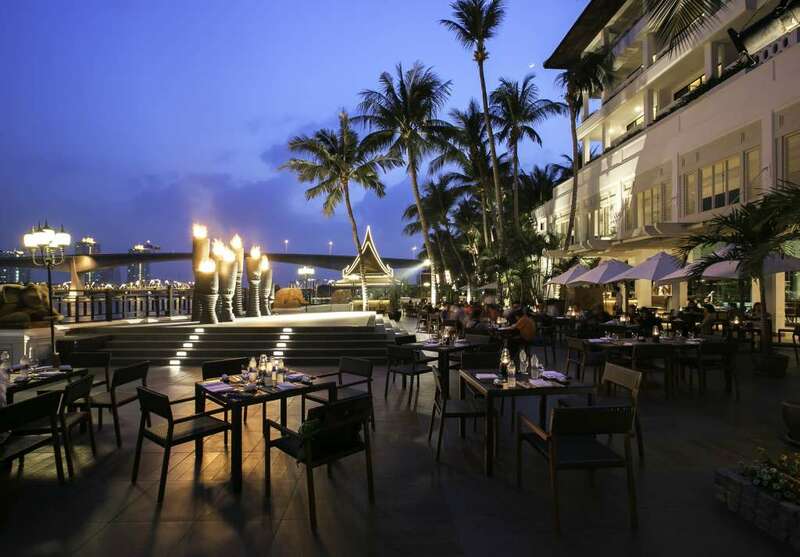 THB 8,500 net per person with pre-dinner cocktails at the Longtail Bar from 7.00 pm – 8.00 pm. Add THB 1,400 net per person for a beverage package of free flow soft drinks, beers, standard spirits, wines and sparkling wines. THB 3,000 net per child aged 5–12 years with free flow soft drinks. · Manohra Cruises: New Year’s Eve Celebration on the River of Kings boarding on Manohra Cruises, 7.30 pm – after midnight. Experience refined dining in old world splendour, live entertainment by a wonderful guitarist and a prime vantage point to watch sensational fireworks erupting all around with the perfect backdrops of heritage attractions along Chao Phraya River. 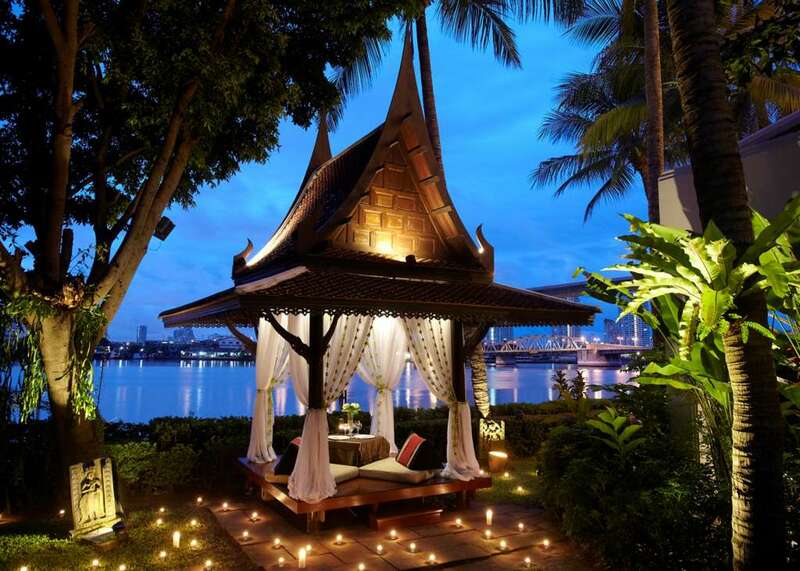 THB 7,900 net per person with a glass of sparkling wine and pre-dinner cocktails at the Longtail Bar from 7.00 pm – 8.00 pm. Add THB 1,500 net per person for a beverage package of free flow soft drinks, beers, standard spirits, wines and sparkling wines. Private boat for luxurious celebrating party is available with a specialty four course set menu and free flow champagne at THB 300,000 net per private boat for up to 10 persons. · Trader Vic’s: New Year’s Eve Wine Dinner with spectacular fireworks at Trader Vic’s, 6.00 pm – 10.30 pm. This true gourmet’s evening begins with a glass of sparkling wine, followed by a four course set menu of chef’s finest creations, with an expert wine pairing for each course. THB 6,000 net per person. · Trader Vic’s: Private Pergola Magical Wine Dinner at Trader Vic’s, 6.00 pm – 10.30 pm. Spoil someone special with an exclusive dining experience on the last night of the year. Savour a sparkling wine aperitif, followed by a set menu with wine pairing in a private pergola in our tropical riverside garden. THB 25,000 net for two persons. 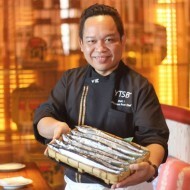 · Trader Vic’s: Champagne dining by design at Trader Vic’s, 6.00 pm – 10.30 pm. The romance of our signature private dining concept overlooking the romantic view of the River of Kings is a truly connoisseur affair, toasted with a bottle of bubbles. THB 30,000 net for two persons, including a bottle of champagne. · Brio: New Year’s Eve Italian Wine Dinner at Brio, 6.00 pm – 10.30 pm. A coveted occasion of Italian gastronomy, pairing four delectable courses by Italian Chef de Cuisine with elegant wines is a perfect choice to celebrate the great year to come. THB 3,900 net per person. For reservations and more information, please contact Restaurant Reservations at Anantara Riverside Bangkok Resort.